According to Canadian law, business is not a legitimate charitable purpose. 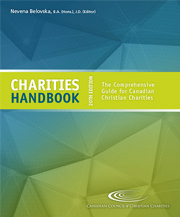 Consequently, charities are not permitted to carry on business activities except to a very limited extent. The federal Income Tax Act (ITA) states that a charity (excluding private foundations) will not jeopardize its charitable status if it engages in “related” (vs. unrelated) business activities. There are two kinds of related business activities. First, a business activity that is limited, ancillary, and related to the charity’s objects, for example a college’s bookstore. A related business will also include any business activity, even one that is unrelated to the charity’s purposes if it is run substantially all (90%) by volunteers. Therefore, it is important for charities to have a clear understanding of the definition and types of related business activities.